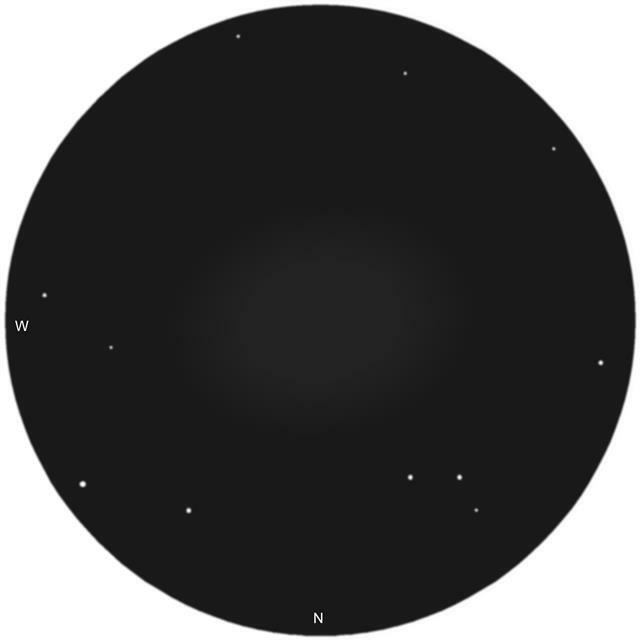 Seven decades ago, while scanning a Palomar Sky Survey plate of the area around brilliant Regulus in Leo the Lion, astronomers Robert Harrington (no relation) and A.G. Wilson noticed a faint blur of light just 1/2° north of the star. They may have thought at first that the glow was just an internal lens flare caused by stray starlight, but it soon became apparent that they had discovered something very real. 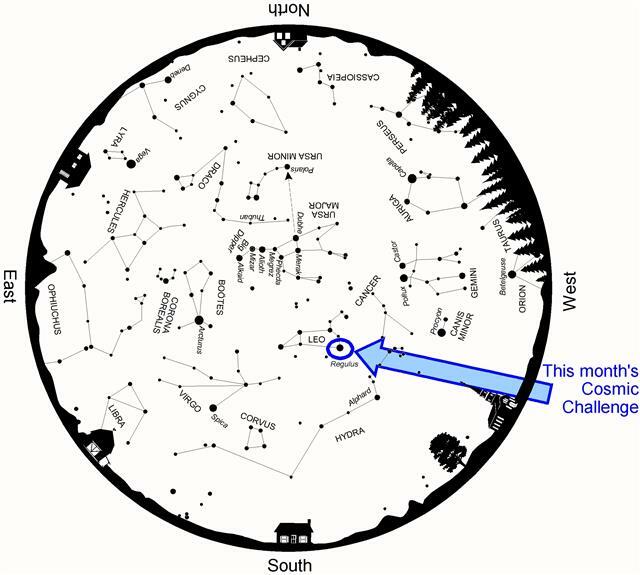 Above: Spring star map showing the location of this month's Cosmic Challenge. Above: Finder chart for this month's Cosmic Challenge. 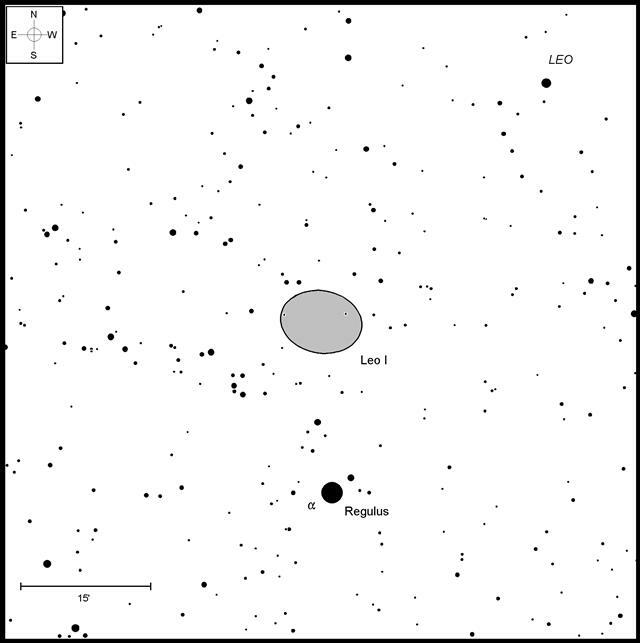 Today, we know their find as Leo I, one of many dim dwarf spheroidal galaxies orbiting the Milky Way. Leo I has a total mass equivalent to only about 20 million solar masses. That's a drop in the galactic bucket compared to the Milky Way, which is comparable to about 600 million solar masses. Dwarf spheroidal galaxies are something of an enigma. Like elliptical galaxies, they show very little evidence of nebulosity or star formation. As with many dwarf galaxies, the stars in Leo I contain a very small proportion of heavy elements; that is, elements heavier than hydrogen and helium. That tells us the stars are very old, since heavier elements are in abundance in young stars. Dwarf galaxies do, however, contain unusually high amounts of dark matter. Indeed, pound for pound, dwarf spheroidal galaxies have more dark matter than any other type of galaxy in the universe. A study conducted by Jaroslaw Klimentowski of the Nicolaus Copernicus Astronomical Center in Warsaw, Poland, and colleagues entitled Tidal Evolution Of Disky Dwarf Galaxies In The Milky Way Potential: The Formation Of Dwarf Spheroidals," Jaroslaw Klimentowski, Ewa L. Lokas, Stelios Kazantzidis, Lucio Mayer, and Gary A. Mamon [Mon.Not.Roy.Astron.Soc. 397 (2009)] suggests that dwarf spheroidal galaxies begin life embedded in halos of dark matter. Over time, the dwarf galaxies orbit around and pass near or through the larger galaxies to which they are gravitationally bound. During each close passage, the dwarfs are stripped of some of their original mass, including star-forming nebulosity. While these kamikaze maneuvers have stripped away the clouds of interstellar matter, the dark matter halo appears to remain largely unaffected. There are two dwarf spheroidal galaxies within the constellation of Leo, appropriately dubbed Leo I and Leo II. Finding Leo I is no problem at all. Simply point toward Regulus and look 20' due north. What's that, you don't see it? I'm not surprised. Although Leo I shines at an integrated magnitude of 10, its surface brightness is closer to 15th. That depressing number coupled with the blinding glare from Regulus is enough to hide Leo I from view. In fact, it did for all the classical observers, such as Messier, Méchain, and the Herschels. Spotting Leo I successfully takes a little planning. First, switch to a high enough magnification so that Regulus can be moved out of the field. Avoid the temptation to use too high a power, however, since the galaxy's soft glow is easily dispersed into the background. Leo I spans about 10', so its span appears to extend about 1/4 of the way back toward Regulus. Keep in mind that after you aim at Regulus, your "observing eye" will no longer be fully dark adapted. Therefore, aim toward Regulus with your other eye and shift it out of the field before switching back. Now, compare the view with my sketch below. Can you see the pair of 12th-magnitude stars just off the northeastern edge of the galaxy, as well as the triangle of 12th-magnitudes off its northwest? Position them toward the edge of the field, and then slowly sweep back and forth for the galaxy's vague oval glow. Remember, it will appear quite large in the field. Above: Leo I as sketched through the author's 18-inch (46cm) reflector. I have found that the best eyepiece through my 18-inch (46-cm) reflector for Leo I is a 10-mm Tele Vue Radian. The combination yields 206x with a real field of view of approximately 17'. Although Leo I fills a good part of the view, there is still enough open sky around the edge to identify the galaxy. While you are ferreting out Leo I, keep an eye out for IC 591, a small spiral galaxy just 15' to the west. Look for a tiny, dim smudge just west of a very faint field star. Using the right eyepiece and knowing the field will help you add this dwarf spheroidal to your list of conquered challenges with comparative ease. But don't get too cocky. Spotting its sibling, Leo II is an even greater challenge. But we will leave that for a future column. Have a favorite challenge object of your own? I'd love to hear about it, as well as how you did with this month's test. Contact me through my web site or post to this month's discussion forum. Until next month, remember that half of the fun is the thrill of the chase. Game on! Phil Harrington writes the monthly Binocular Universe column in Astronomy magazine and is the author of 9 books on astronomy. Visit his web site at www.philharrington.net to learn more. Phil Harrington's Cosmic Challenge is copyright 2017 by Philip S. Harrington. All rights reserved. No reproduction, in whole or in part, beyond single copies for use by an individual, is permitted without written permission of the copyright holder. Thanks for the nice article Phil. I've read your very informative articles elsewhere but I didn't know you did a Cosmic Challenge each month on CN. So you just gained a new reader and I'm already looking forward to next month. Your drawing is excellent and spot-on to what I see in my 17.5". Four days after I saw the galaxy in 4" we were out with a friend testing his new 150/950mm TS achromat. In 6", Leo I it was much easier object - still not easy one. In 4", the galaxy was just phantom at the edge of detectability (in fact, I made myself sure only when I compared the sketched position with the images later on at home). In 6", there was no doubt at power of 72x. I was surprised that this difficult object was seen also by completely unexperienced friends that were with us. Typo: 457mm. Otherwise 457cm will be nearly as big as the Palomar one. In a 4" refractor?! Those Zeiss optics are outstanding.! The 4" refractor was humble SkyWatcher ED100 f/9, not Zeiss. This was my main DSO refractor at those time, it was replaced later on by AS110/1650 which I keep in my darker-side observatory shed (in both cases, I spotted the galaxy from this shed). The trick was to use high enough magnification and narrow FOV eyepieces. First, I suspected the galaxy in Baader Genuine Ortho 12.5 (72x) and then also at 36x in Kasai 25m ortho. The galaxy was invisible in 55mm Televue Plossl (16x). Sorry, saw the Zeiss in your sig line, so thought that was the scope. That Sky-Watcher is a nice scope. I review the 4.7-inch version of that scope in the June 2014 issue of Astronomy magazine and came away very impressed with the optical quality. I've observed Leo I on a number of occasions but only with substantial apertures. I've also seen the far-more-difficult dwarf spheroidal galaxy Leo II. Leo I has been the challenge deep-sky object for April in my Celestial Calendar. The way I most recently found Leo I (Regulus Dwarf) in the 20" was by locating the small spiral galaxy IC 591 first, then letting the image drift at high power (9mm T1 Nagler for 278x). This was a useful method as it let me dark adapt at higher power on the smaller object and pick up the low surface brightness glow of Leo I as it drifted into the field, while not venturing near Regulus again. This was in surprisingly dark skies for my low altitude "blue zone", peaking at 21.57 MPSAS that night. My notes say it was larger than I remembered. I had seen it many years before from a dark site with my 8" SCT using the same eyepiece for 226x. The same night this January I also found Leo II and Leo A (or Leo III depending on preferred designation) in the 20". Leo II was much larger even than Leo I, but since there were no bright stars nearby, I was able to use low power and a 6.2mm exit pupil to detect it in averted vision at 81x, centered on a 13.7 mag field star. Leo A (III) had somewhat higher surface brightness and was readily detected. I did not try for Leo T, discovered in 2006. I can't even really see more than a faint trace of it in the Wikisky images. At 16th magnitude and incredibly low surface brightness with only about 40,000 suns luminosity, it is probably not even a visual object. Thanks for sharing such nice article dear Phill.well done. I remember seeing this in my 18" f 4.56 SRE with a 20mm Televue in dark conditions back in 87 This year I took this picture of it. Very nice shot! Thanks for sharing.